Just as we farewell and welcome the New Year, so do colour trends and palettes change. Each year Pantone announces ‘colour of the year’ which all on-trend fashion and home décor designers follow when releasing their own designs. The colour of the year in 2015 was Marsala. A deep, sophisticated earth-toned red that looked magnificent in home décor, on runways, pret-a-porter fashion, and makeup palettes alike, but time marches on, and a new year calls for a new colour palette. Pantone has chosen its new reigning colour for 2016 and for the first time, there were two colours chosen to make up the colour of the year. While Marsala was strong, deep and earthy, Rose Quartz and Serenity are more ethereal, subdued tones. They are light, airy and relieve your stress just by looking at them. They ignite feelings of tranquility, calm and relaxation. 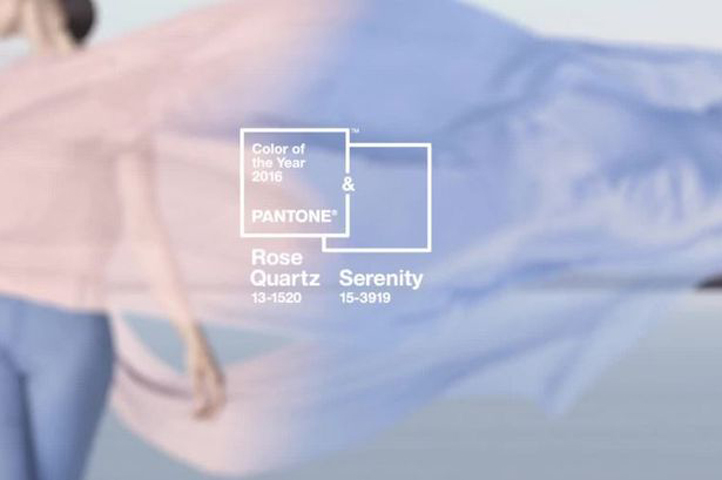 Although the combination of Rose Quartz and Serenity challenges traditional perceptions of colour association, it undoubtedly creates an air of connection and wellness. Rose Quartz – a light pinky-purple, and Serenity, a light sea blue are reminiscent of a picturesque desert island, or Mediterranean sunset. They are spring-summer colours, and won’t necessarily flatter everyone in terms of cosmetics, but like all tones, their shades can be modified to work. These calm tones will work well in every home, from a beach house to a classic home full of oak furniture, to adding designer touches to a modern condominium. While the colour comes across as being feminine, Pantone representatives insist that is not the case. Fashion-forward men are daring to wear pinks, purples, blues and turquoise, and 2016 will prove no different. Men will undoubtedly be wearing splashes of these colours on their ties, socks, and even their shirts. Women will don bigger fashion pieces, such as dresses and shoes with these tones, as well as statement necklaces and semi-precious stones and pearls. No doubt these colours will be big favourites for nail polish in the spring and summer. In the home, Rose Quartz and Serenity can be paired with both light woods, like cedars, pines and oaks, for a relaxing and playful look, and dark woods, like cherry, to give a sophisticated and stylish accent. Both colours will also work well with mixed metals, like brass and copper, as well as silver. As for graphic, poster and digital design, Rose Quartz and Serenity already form part of most design programs, and only need to be brought forward to give any project a trendy, contemporary touch. So if you want to be on trend with your home design in 2016 then look no further than Rose Quartz and Serenity to freshen up your décor and bring calm and relaxation to your home. Posted in Lifestyle | Tagged in | No Comment.